CCC, a leading European shoe manufacturer, has expanded its warehouse and factory in Poland considerably in recent years. Mark Climate Technology has supplied a total of 135 devices for a pleasant indoor climate, including radiation panels, recirculation fans and roof extraction fans. 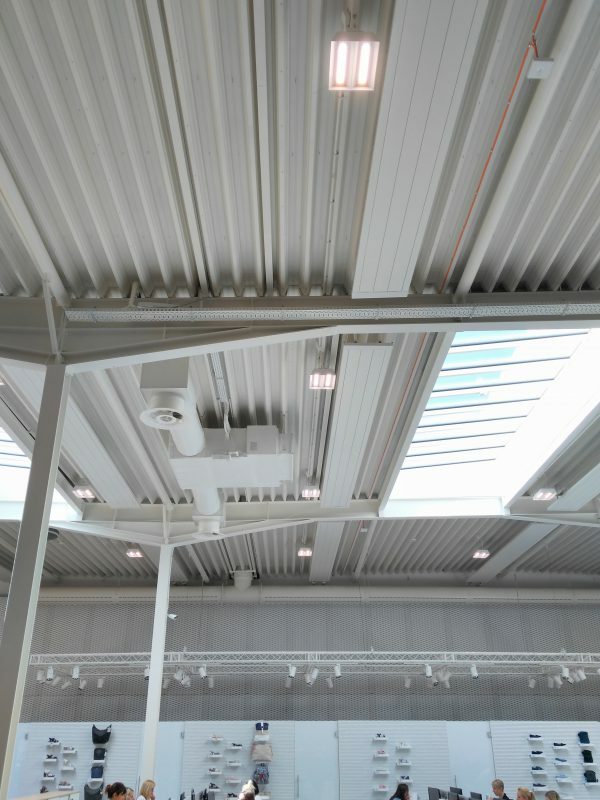 The showroom of CCC is equipped with Mark Infra Aqua Design radiant panels. These aesthetic, flat, lightweight aluminum panels are easy to install and use. The panels are thermally insulated with mineral wool or polyurethane foam. They can be used in both high halls and in low spaces. In addition, they can also be processed in system ceilings. The attractive design of the radiation panels guarantees a wide range of applications, both in industrial buildings and public facilities. Infra Aqua Eco panels are installed in the warehouse. 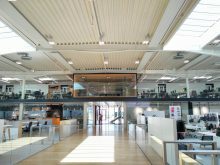 These economical lightweight water-supplied radiant panels can both heat and cool. 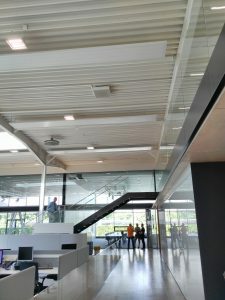 Radiant panels offer the possibility to heat without displacing air. The heat is also only obtained at the location where it is needed. Due to the short warm-up time and a lower room temperature, a high energy saving can be realized. In addition, there are ECOFAN devices in the warehouse. These recirculation fans ensure that the rising warm air is transported back to the floor. As a result, the room heats up faster and consumption can be reduced up to 30%. For the extraction of used air from the building, there are 18 MDV Blue roof fans on the roof. These fans guarantee a very low power consumption in combination with excellent performance. Mark Climate Technology has been a specialist in climate control for almost 75 years. From the head office in Veendam and sales and service locations in Belgium, Germany, Ireland, Poland and Romania, Mark delivers a leading range for cooling, heating and ventilation.